Well I owe a few of you a great big thank you. I’ve been nominated for three blogger awards over the past few weeks, and I’m so grateful to all of you. I’ve found an amazing amount of support in the blogger community….I had begun to think of myself as one of a kind, which is a very lonely place to be. So thank you to all of my 42 followers (42 in a month, that’s f*Cking cool)…..thank you for reading my stuff, writing me comments and emails and generally just being some of the most accepting people I have found. So here are my nominations for the Gargie Award, so wonderfully handed out by the very talented Writing the Body. This is my favourite Dom written blog, he is brutal, honest and actually quite funny, if you get the chance check out his My Relationship Is Not A Democracy. I love his style, I also love that type of possessiveness he seems to have in droves….. I love this guy, I miss this guy…..WHERE ARE YOU! Come back and keep writing your witty, fantastic posts…..and the pictures are cute too! Pretty much anyone who reblogs me is cool, just kidding, this sub has an eye for great pictures and a great story to tell…..check her out. I love Geisha for a few reasons, she is an active, intelligent reader. Put all that aside, I love exploring her blog, she’s got a great mix of images, quotes and lyrics. A woman after my own heart. Beautiful honesty and tantalizing sexiness……..who could ask for anything more. I’ve found that the blogging community really is a social one, so lets pass on the love people. Find 5 to 7 bloggers you love and tell us about them. 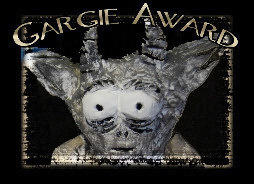 This entry was posted in Awards and tagged amazing bloggers, amazing blogs, blogger awards, blogs to read., Gargie awards. Oh my gosh! I read down your list of all the amazing bloggers (Vile just tickles me AND makes me think) and there I AM! Thank you SO much. Excuse me for shouting in ALL CAPS! Aw! I am flattered beyond belief. Thank you and congratulations on your award as well! 🙂 PS – I love Vile’s blog too … he is very cool.